The sport is full contact armored fighting with live steel. Schaive was part of the original group of 30 fighters who represented the United States in its debut at the Battle of the Nations in Warsaw, Poland, in 2012. “We got beat up pretty good,” he said. “We earned a lot of respect. We went and fought the best in the world.” The team won the award for Best Debut Team that year. Twenty-one men wearing the United States colors walk out and you look across the list and see 21 men wearing their nations’ colors carrying two-handed axes, swords, pole axes. “You realize this is not high school football,” said Schaive. When the fighters returned from Warsaw, he, Sinou and Jaye Brooks started the Armored Combat League. The USA Knights are part of the ACL and represent the United States in international competitions. Schaive compared being part of the ACL to being part of the local union. “It’s very close-knit with deep family ties,” he said. Each country puts forward three five-man teams, three singles fighters and one 16 on 16 team. Last year a 50-man team traveled to Aigues-Mortes in southern France and competed against 23 teams. The premier five-on-five Striking Eagles team took fourth in the world. “It was phenomenal,” said Schaive, who is part of the team. “I’ve always been fond of medieval history,” said Schaive. He loves reading stories about the Black Prince and Henry V. “I’ve always been drawn to armor.” He became involved in the SCA because he wanted to compete in armor. The sport changes you. “It’s a singular journey,” said Schaive, who is training at a level he hasn’t trained at since his Army days and has lost 33 pounds. He does Crossfit three to four days a week, massive amounts of cardio, physical training in full armor and flat out fighting. His steel of choice is a two-handed pole ax – a 6 ½-foot-long wooden pole topped with a 7-pound steel ax. It’s a violent sport. Medieval combat was not gentle. Schaive compares it to Greco Roman wrestling, mixed martial arts, boxing and a street fight combined into one. Participants are big, strong and fast with salty dispositions and a tendency towards violence. “You have to be comfortable with violence,” he said. The International Medieval Combat Federation replaced the Battle of the Nations and this year the international competition will be held in Belmonte, Spain. This will be the first year women will be allowed to fight in international competition. “Women want to get tested,” said Schaive. He sees the national team as ambassadors when they travel to international competitions. “Some countries have no contact with Americans or have strong beliefs about the United States and Americans,” said Schaive. The national team is held to a high standard and team members must uphold the ideals of a knight. “Crowds expect to see knights,” said Schaive. 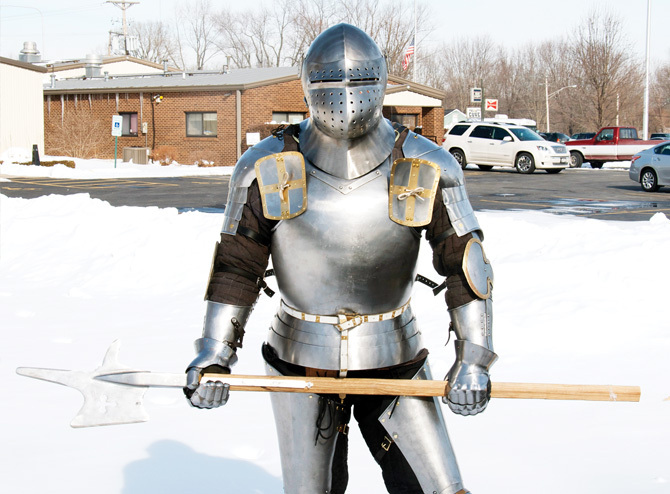 “You have to act like a knight, look like a knight and fight like a knight.” Everything from weapons to armor must be documented and historical. “If it doesn’t look like it came out of a museum or a manuscript or an effigy, you can’t compete,” he said. The Spring Nationals tournament will be March 29 at the Illinois State Fairgrounds Livestock Center from noon to 3 p.m. Admission is $10 per person or $25 per family. The 50-member United States team will be announced. Schaive encourages people to come out. He’s had an outpouring of moral support from his union members. He said his union family has been nothing but supportive. Roberta Codemo can be reached at rcodemo@hotmail.com.